This press release is from the Small Stones Festival of the Arts webpage. The Blackstone Valley Art Association is a partner in this project. 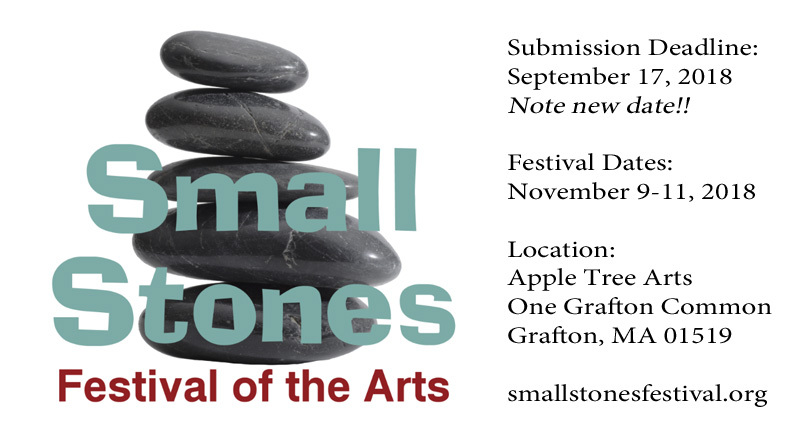 The Small Stones Festival is a collaboration of Apple Tree Arts, the Worcester County Camera Club, and the Blackstone Valley Arts Association. A major part of the festival is a juried exhibition of fine art and fine art photography, to be held in the Great Hall at One Grafton Common. Fine Art – First Prize: $500. Fine Art – Second Prize: $250. Fine Art – Third Prize: $100. Fine Art Photography – First Prize: $500. Fine Art Photography – Second Prize: $250. Fine Art Photography – Third Prize: $100. There is a nonrefundable submission fee of $10 per submitted work.